Bengal Cat Forums • View topic - Bengal Behaviour: Spraying Issues. Post subject: Bengal Behaviour: Spraying Issues. Firstly, congratulations on your Bengal cat. I hope that before choosing your new family member that you have researched the breed and are aware of the common temperaments that you may find with your new friend. Many Bengal owners become completely addicted to this wonderful breed and they make fantastic pets and family members, however, due to the relatively close blood lines to their wild ancestors the Bengal’s do exhibit some behavioural issues. Most of which CAN be resolved with time, patience and perseverance. This thread is intended to address one of the most commonly mentioned behavioural issues:- Spraying or peeing around the home. Below are some tips and advice from the various experienced Bengal owners who have experienced this problem with their own Bengal’s. It’s important to note that the information and tips below are not exclusive and should be used as a guide with the purpose to help owners, who are new to this behaviour, in order to work with their Bengals to resolve their cat’s spraying behaviour around the home. Of course common sense and the welfare of your cat should always be considered with the utmost priority and some spraying issues may be due to medical reasons. It is therefore important to consult you vet should any spraying issues continue to rule out possible medical concerns such as UTIs etc. I hope you find the below as a useful source in trying to resolve your own Bengal’s spraying issues as it is important to understand the reasons for this behaviour in order to resolve it. #1 - Rule out illness – get a vet check 1st and foremost. There is no quick fix. #2 - Is the cat neutered? – if not it should be. However, some owners have found spraying to occur after spaying or neutering. Consult your vet if this is the case! >Give more water. Add meat juice to drinking water to encourage more drinking, or add water to food to make it mushy/wet. Feed a wet diet and/or Urinary diet. >	Feliway diffusers or spray. #5 - Rule out territorial marking – is a cat outside causing upset, hide views of outside. >	Are you cleaning it so it doesn’t smell of cat (my vet said don’t clean it every day, yes keep it dry and free of poo – scoop) but don’t wash all the time. Let it have a little cat scent. >	Is it wrong type of litter, wrong box type (some cats don’t like boxes with lids and love plenty of room, others prefer lids for privacy). >	Moving one box 2 inches away from the wall may help. >	Always place litter trays a fair distance away from their food (either in another room or at least 4ft away from feeding dishes. > Ensure there are enough litter boxes for your cat family. >	Kittens can get lost easily in a big house so have a litter box per floor at least. >	Some cats like to pee in one box and poo in another, so adding an additional tray may help. >	You really need to get rid of the wee scent. Normal household cleaner may remove the stain and smell from us humans, however, cat urine is very potent and residual scent is left even after cleaning. >	Use a proper cleaner. Urine Off is the most recommended by Bengal owners. >	Sometimes they will mark where you have used fabric softener, feathers or bleach. To a cat it’s all about texture and smell. Laundry smells good and has a nice texture. Beds feel safe. >	One vet suggested it acts as a high up mound with your smells to intermingle and say – hey look this is my home, smell my smell I feel safe here. A cat in the wild will scratch and wee in high places that other members of its territory have also marked. >	Restrict access to your bed’s etc that they wish to mark. >	Introduce your cat slowly back to bedrooms once the spraying behaviour is resolved, but only under supervision. >	Rub your cats cheeks and rub your hand on your bed to transfer you cat’s scent and make it smell like them. This may minimise the urge to scent your bed after other spraying issues have been resolved. >	Cover sofas – you can buy special sheets etc. >	A cheap plastic shower curtain can prove a good deterrent. >	Don’t stress your cat out when going litter box. >	Don’t push your Bengal in the litter box when he/she is trying to wee on the bed/sofa etc. >	Don’t shout at your Bengal. Cats DO NOT understand this human behaviour. It will only stress both you and your cat. >	Under no circumstances at all should you hit or physically discipline you cat!! This only causes your cat to mistrust you. This DOES NOT resolve this behaviour. Your cat is not ‘being naughty’ and should not be punished!! >	It is no good getting angry after the wee as it only adds to stress levels and cats are not supposed to know why you are shouting at them after the event. #8 - Learn the ‘rain dance’ and ‘wee times’. If you go and dig in the box it is a bit like the equivalent of running water when humans need to go. It may encourage your Bengal to go. 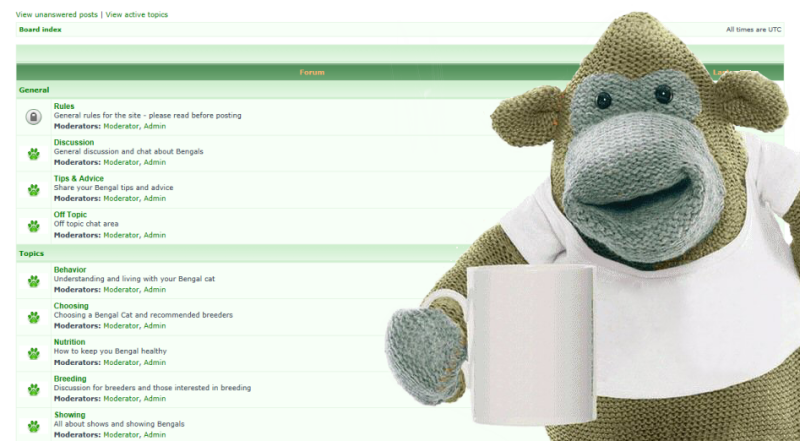 #10 - Lastly – come and talk to your friends on the forum. Many of us have been through this. You will need support too! If your Bengal goes potty in any of these places, the cat does not have “poor litter box habits”, you simply aren't following Roxanne's rules. According to Roxanne, all of these things look identical to litter boxes when seen through Bengal eyes; so now that you have read the list, “you should have known better.” Peeing in the sink and bath tub are also not “poor litter box habits”. These are valid places to pee as Bengals are smart and know that water will run there (in nature they will pee in streams and creeks). Simply follow up with Clorox and rinse with water. You will actually come to appreciate that you are scooping less! Of course you should also take your Bengal to the vet to rule out health issues as well. If you are considering breeding Bengals, you should know that most queens spray when in heat, especially if there is more than one girl in the house. It seems to be a common misconception that only male cats spray. Don't think that you can avoid the spraying issue by having only females and using outside stud service. Thanks to TigerTea, JungleRose and Katie for their additions to this topic! I hope you have found this informative and useful to help resolve your own Bengal’s spraying behaviours. Vicky, good to see such advice all in one place. Just read this why didnt i see it sooner!! some great advice, chatting on forum to get more! who just recovered from MRSA and a bladder filled with crystals. Even though he is crystal free now and has no infection, he stopped using his littler box. The vet felt that due to the stress and trauma of being sick, he should go on anti-anxiety meds. Hopefully this helps. I will make sure I remove all items that could encourage him to urinate on. The smaller cat seems to like attacking his bigger brother (the one with all this 'issues') - which adds even more fun to the situation. Funny you should mention this I have 2 brothers as well but they are not Bengals & they were spraying so bad Inside that I had to get a cat enclosure built so at least I could remove effected carpet & replace furniture, I did all the things you mentioned & they seem to be healthy eating propley, no blood In the litter tray & I always used the same litter so I can rule those things out I think that the issue is other cats coming Into my yard & causing them stress. I do let my Black Cat sit on my lap when I'm watching TV but as soon as he gets off I put him back into the laundry so he can at least go outside through the pet door & If he dose spray it won't damage anything. One thing I have learned from this is that If I do get the chance to own 2 Bengals I won't get 2 males as I think my cats could also be competing for territory. Post subject: Re: Bengal Behaviour: Spraying Issues. Hi, we have an 8 month old Bengal female kitten. She's came into heat for the first time about 2 weeks and displayed very extreme behaviour for 2-3 days (flattening, presenting, yowling, off her food etc) but then seemed to revert to normal quite quickly. Since then however she's decided to start peeing by the front door and now by the French doors. She doesn't seem to be going anywhere else in the house. We were hoping to have one litter of kittens with her, but didn't really want her to have them before she was a year old. I'm not sure I can cope with this peeing for the next 4 months though! Can we stop this behaviour? Or if we can't - if we do have her spayed will it stop naturally? Very useful tips about how to discourage her - I just wondered if there were any specifics given the fact it's just started since she came into season? Can i ask if you got your bengal on the active register? Why do you want her to have 1 litter? She will continue to have 'calls' before she is mated or neutered. She can 'call' for several days with a 1-2 weeks break and then 'call' again for several more days. She can spray/wee when in call and it can then become a behaviour that is hard to break. With each unmated call she is at risk of developing a fatal illness called Pyometra. She should not be mated before 12 months of age and should be health tested before for HCM and PK-Def and will need a SNAP test prior to going to stud. She's not on the active register no. She's fully immunised/ tested and hasn't ever been outside so she definitely doesn't have any diseases. The vet suggests that it's stress about the outside world as it's only at the access points. We are trying Felliway to see if that calms it down. We'd like her to have some company and feel that she'd probably bond better with one of her kittens in the future. I'd look for a stud when she's closer to 1yr old. You really shouldn't be breeding from her if she is not on the active register. This is generally against the contract with the breeder. There are a number of reasons for this. She may not be of good bengal type to be bred from. There may be some genetic defect that will not affect her as a pet but would not be wise to pass on. She should be health screened for HCM before being mated as this is a major concern amongst begal cats but also amongst the cat world so no breeds are safe really. She should be tested for PK-Def prior to mating as this will cause a major problem for kittens. You will need to find a stud cat that is also health screened for the above. You will need her to be SNAP tested prior to breeding and the stud cat will also need to prove that they are FIV and FELV negative for you. If you do none of the screening mentioned you put the health and welfare of your cat at risk, but more importantly you can pass of some serious life threatening conditions to kittens. It is a very common misconception that female cats settle and become more homely after having a litter of kittens. This is not accurate in the slightest and is an 'old wives tale'. Leaving cats un-neutered puts them at a great risk of health problems. A neutered cat is just as likely, if not more likely to settle and become homely as they don't have raging hormones interferring with their 'bonding' time with you. Having kittens actually changes the personality of cats sometimes for the worse and they become unsettled living in multicat households. Often you will see ex breeding queens for rehoming stating that they must be an 'only' cat. If you go through with having a litter of kittens you will need to be sure you have planned for every outcome. Having sufficient funds in place should a caeserian be necessary. You will need to know what they signs of labour and distress whilst in labour are so you can identify problems in advance. You will need to have an area in the house that is very quiet for her to have her kittens. Some breeders have them born in their bedroom so they can keep an eye on them at all times. Some have a room just for kittening which has a bed so that they can sleep in their for a bit. You will need to have equipment on hand should you need to supplement the feeding of the kittens. The kittens should stay with you until you get them vaccinated at 9 and 12 weeks. They will be ready for rehoming at 13 weeks, any earlier and you put the kittens health and socialisation at risk. New breeders have a 'mentor' to help guide them through these things. I really recommend that you get your girl neutered. Think very hard about whether you can enter into breeding and then go and talk to some breeders about helping you. Breeding from a cat on the 'none active' register is not really the right thing to do. Sorry. Take your advice on board and will get her registered and tested if we do decide to have a litter with her. We will either do this and have a litter with her when she's around 1 or have her spayed, so the comments about never having a litter and the associated health problems aren't relevant as I don't intend to leave her unspayed ad infinitum..
My query was about the spraying around the house rather than breeding, but thanks for your extensive reply. If anyone has any comments about the spraying, I'd be most grateful. The suggestions that the vet has come up with seem to be helping. She is spraying because that is what un=neutered females do. They do it to attract a mate. She will continue to do it until mated or neutered unfortunately. This is something that breeders have to contend with. She will mark areas which she thinks gives her the best chance of attracting a mate, thus the marking around doors and exit points. Your vet will probably be unaware of this kind of behaviour as it's commonly thought that only entire male cats spray, this is incorrect. As your girl has already started spraying, the longer you leave her entire the more chance there is that she will carry on spraying, even after she has had a litter. IME some Bengal females are worse than males when it comes to marking territory. This is a chance you are taking by your decision not to spay her. Breeders are equipped to deal with this; it's part of the breeding process which can be rather testing to say the least. I would think that you would be very hard pushed to find an outside stud, as no genuine breeder will entertain taking on an unregistered girl, so your only other option would be to settle for an unregistered stud that is likely advertised on a free-ad site by an unreliable 'breeder', and then you would be blind to any potential future health issues. If you have decided to carry out the relevant health testing before you mate your girl then you will be paying the same amount - if not more - that you would pay for a new kitten. I would advise you to spay your girl - as soon as her hormones settle down again she should hopefully stop spraying - and home another kitten. Your girl is still relatively young and there is absolutely no reason why she wouldn't take to a new young friend, especially a male kitten. This really is the most sensible option for you IMO, and it will most probably save you from potential health problems and behaviour issues.